Home › Transgender, Transsexual, Trans › Deaths, Murder › Recent spate of transgender suicides: An actual increase or more awareness? Recent spate of transgender suicides: An actual increase or more awareness? 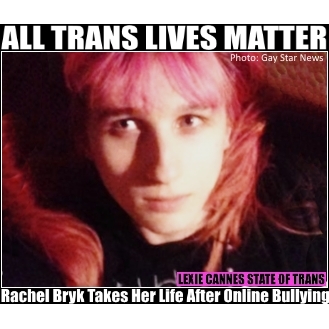 LEXIE CANNES STATE OF TRANS — In this space I tend not to report individual transgender suicides unless the event is of extraordinary note. All trans suicides are tragic and as most of us are aware, the sobering sky-high rate of attempted suicides (41%) in the trans community is well-documented by research evidence. From that we can infer the number of trans people lost to suicide as equally sobering. Tracking suicides, however, is problematic. Mainstream media in general does not report on individual suicides, trans or otherwise, unless particularly newsworthy. Even if they were to, the trans status of the deceased would not likely be disclosed. Most recently, since the death of Leelah, there seems to be an uptick in the number of reported transgender suicides. But is this an actual increase in deaths? Trans suicides outnumber trans murders by wide margin — conservative ballpark numbers based on the existing attempt figures would make it two or three trans suicides every day in the United States. In my opinion, since Leelah, people are making their suicides matter — they’re messaging their friends and posting it online. No longer are families able to quietly keep things under the radar. Like Leelah, they’re telling the world why they’re doing it. New studies are being undertaken that might shine some light on the matter. Until then, there’s no reason to believe there is an actual increase of transgender suicides. The suicide that triggered the writing of this article was of Rachel Bryk. She jumped off the George Washington Bridge in New York City last week after being attacked online. Her body has not been recovered. Her death is tragic, but no more or less tragic than the one reported two weeks ago, or the one reported 3 weeks ago. All trans lives matter. Lets hope our amazing accomplishments in the trans rights and public awareness department the last two years has triggered a reversal in the rate of trans suicides. If someone’s thinking right now about suicide, please don’t. Things will get better. Give life another chance. Please try to talk to a friend or call the suicide hot line 1-800-273-8255. It TOLL FREE. I have a bit of double feeling about this because not every trans will kill him|herself because of being trans , like everyone there can be all reasons . As I understood Rachel was ill , I believe it was chronic pain but correct me if I am wrong about that , but that could be a factor too . I think what we can do for our own community is being realistic towards towards our younger ones in their expectations . The expectation is many times , “once my transition is complete my life will begin ” , ” I will be happy then ” , and a fixation on the physical transition and not so much on the mental part of it . Understandable , how can you prepare yourself on that and every life will develope different . I do believe things will get better for us , I believe this because it already has gotten better from where I started but a lot needs to be done still and maybe talking respectfully with our younger generation can be part of that . As a family member of Rachel’s, all of what you said hits me as true. She did experience online harassment that contributed to her death but there were other factors such as her physical pain. I further believe that she likely hoped that once she began her transition, all of her emotional demons would go away. While I can’t speak to all that happens mentally and physically during that time, I’m sure that a person’s hormones are going wild which can drastically influence depression. I believe this article here is absolutely important but there are other things that still need to be discussed such as depression and the trials and tribulations of transitioning. My biggest hope is that Rachel’s death will allow some people the space to acknowledge that transitioning doesn’t magically fix everything; that’s the dialogue I feel we should all be having, in addition to holding those awful people online accountable. Folks should know that transition won’t solve non-trans issues, and you may have new problems like unaccepting society. I wish we could teach kids to be stronger and not let things like online bullying hurt them so much. That’s relatively minor compared to actual violence! One would hope that the opposite effect would eventually occur — increased visibility of trans people leading to greater social acceptance leading to decreased suicide rates. I am convinced that invisibility and powerlessness is the leading cause of these terrible deaths. Trans people have mnay mental problems. I’m pretty sure no one cares about your opinion, Bruce.